• White House: "Shulkin Resigned"; Shulkin: "Actually, I Was Fired"
As a candidate, Donald Trump was a big supporter of states' rights. As president, he addressed the governors and told them to "make the states the laboratories of democracy again." However, in practice, it turns out that he is only interested in this lab work when the labs give him results he likes. In short, when a state deviates from federal policy and does something that Trump supports, the state gets nothing but praise from him for acting boldly. But when a state opposes his administration, it often gets sued. As a candidate, Donald Trump was a big supporter of business, bragging about his financial acumen and his enormous success in the private sector. As president, he has sometimes put that pro-business philosophy into action, slashing regulations, supporting the GOP's massive tax cut (even though he had little to do with getting it passed by Congress), and claiming responsibility for job creation at every turn (even when such claims were dubious). However, as CNN's Matt Egan observes, there are some very clear limits to Trump's pro-business stance. Attacking a major, publicly-traded corporation is guaranteed to make that corporation's stock price plummet, and is all-but-guaranteed to spook the market as a whole. For that reason, it is almost unheard of for a president to publicly lambaste a corporate titan, even if that titan is being sanctioned (e.g., Wells Fargo). Trump, on the other hand, has blasted many of the biggies at one point or another, from Ford to Apple to Goldman Sachs. And this weekend, of course, it was Amazon. Similarly, nearly every economist has concluded—and every recent president has agreed—that trade agreements are usually good things, and that overly-aggressive use of tariffs is very risky, as that can quickly blow up into a trade war. Few phrases send chills down most presidential spines more quickly than "Hawley-Smoot," (or, sometimes, "Smoot-Hawley"), the ultimate example of a protective tariff that boomeranged back on the United States (thus greasing the skids as the country sank into the Great Depression). Trump, by contrast, wields tariffs like they are Colt .44s, and he has no compunction about pulling the trigger. Should there be any doubt on these two points, we all received an object lesson on Monday, when the Dow plunged 459 points (which was actually a rebound from the day's low of minus 758 points) on fears of an emergent trade war between the U.S. and China. There were also concerns that Amazon is about to be hit with regulations that will...well, will do something, but who knows what? So, their stock was particularly hard hit, with a loss of 5% of its overall value, or about $35 billion in total. And Amazon took the tech-oriented NASDAQ with it; Monday's 3% loss means that index is now in the red on the year. It is quite clear that, as with states' rights (see above), Donald Trump's pro-business stance has some pretty clear limits. First of all, his political needs clearly outrank his concern for the U.S. economy. If he has to choose between what his advisors tell him is best for the economy, and what he thinks will please his base, he goes with the latter every time. Hence, the destabilization (and possible cancellation) of NAFTA, the game of chicken with China, the abandonment of the TPP, and so forth. White House: "Shulkin Resigned"; Shulkin: "Actually, I Was Fired"
David Shulkin is no longer the VA Secretary—everyone can agree on that. But how he got to this point is less clear. Shulkin insists he did not resign, and would not have resigned, "because I'm committed to making sure this job was seen through to the very end." He says he did not know the axe was going to fall until he got a phone call from Chief of Staff John Kelly, which was promptly followed by a Trump tweet. The White House says that Shulkin absolutely resigned, although they admit that there's no resignation letter. Why does this matter, beyond the fact that the whole story mildly enhances the aura of dysfunction that engulfs the Trump White House? Well, the Federal Vacancies Reform Act of 1998 gives the President the right to choose a temporary successor for a cabinet officer who "dies, resigns, or is otherwise unable to perform the functions and duties of the office." Note that "is fired" is not on the list. What this means is that it is not clear upon whom authority devolved when Shulkin left. Is it the next person in the line of succession, namely Shulkin's deputy Thomas Bowman? Or is it the person Trump appointed acting Secretary, namely Robert Wilkie? A new Harvard CAPS/Harris poll shows that the interview Stormy Daniels (actually, Stephanie Clifford) did with Anderson Cooper on CBS' "60 Minutes" hasn't moved the needle much on Donald Trump's approval rating. Nevertheless, it did have an effect. As a result of Daniels' interview, and also that of former Playmate Karen McDougal, who alleges she had an affair with the President that lasted nearly a year, Trump's approval has gone up with men (to 53%) but down with women (to 35%), an enormous gender gap. The weighted average approval is 44%. If memory serves, Obama is Sad! And also a Loser! And not even an American, either. So, outpacing him should not be much of an accomplishment. In any case, though, even a glance at the tweet should make one at least a little bit suspicious. First, because the Washington Examiner is not exactly a fount of quality journalism. Second, because the tweet (actually, the re-tweet) is not a link to an actual story, it's a link to a picture of a headline. This makes it rather difficult to click through and read the actual story. Given the position of the Trump icon versus the Obama icon, one might be forgiven for thinking that Trump started out far ahead of Obama, and that Obama has been converging on Trump recently. The color coding at the top doesn't help much, as it's so small that it is hard to tell which one is which. 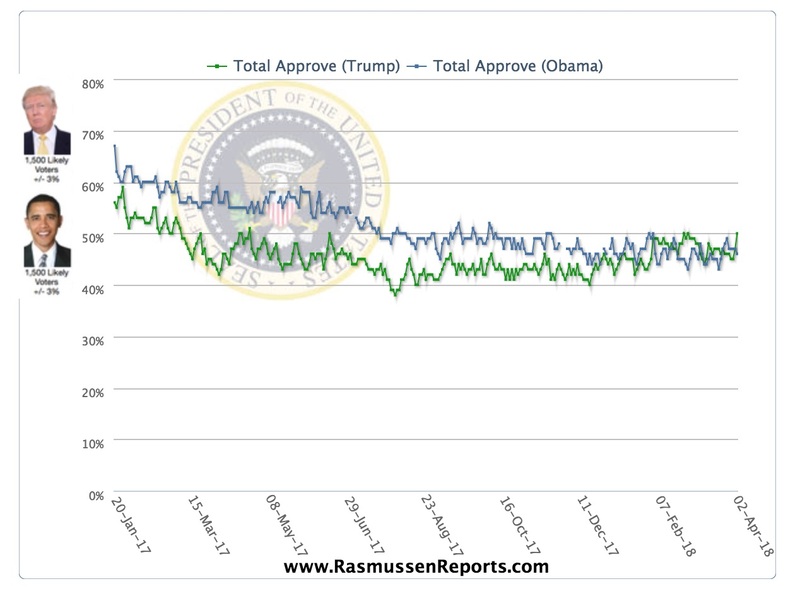 But, of course, the blue line is Obama and the green line is Trump. It is possible to glean this with a careful examination (and a mouse-over), but the graphic is clearly designed to mislead those who do not look carefully. Former "Apprentice" contestant Summer Zervos filed a lawsuit against Donald Trump in New York state court that says he defamed her by accusing her of lying when she alleged that he groped and kissed her. State Supreme Court Justice Jennifer Schecter ruled that the case could go forward. Trump's attorneys—Marc Kosowitz, Christine Montenegro, and Paul Burgo—have now filed an appeal claiming that the state courts have no jurisdiction over the case. They also argue that a defamation charge cannot be grounds for a lawsuit because it was done during a campaign! The first point—which court or courts can be used—is a technical legal question, but the claim that candidates are free to defame anyone they want it as long as it is part of a campaign is virgin territory. More important than the details though, is that the appeal to the Appellate Division of the New York Supreme Court could take months to decide, which potentially buys valuable time for Trump. On the other hand, it is not certain that the case will be put on hold while waiting for the appeal, so maybe it doesn't. Apr02 China Declares (Trade) War Against the U.S.
Apr02 Russian Hacker Is Extradited to the U.S.
Apr01 How Big a Win Do Democrats Need to Take the House? Mar28 Can a President Be Indicted? Mar27 What Is Gates Telling Mueller about Trump? Mar27 Does Team Trump Really Threaten to Rough People Up?